A guide to making your own compost. Wooden Compost Bins: Buy or Build Your Own? Some people prefer the natural look of a wooden compost bin. Although most of the commercial compost bins you see these days are plastic, you do see some wooden compost bins now that are already made. Here are two wooden composters that I like that you can buy. This cedar bin has two large sections so that you can keep two compost piles going at once and compost large amounts of materials. It’s a great choice if you like to compost leaves, which take up a lot of space. Cedar is very durable, and it’s also a readily available wood that is eco friendly. This spruce composter is made from FSC certified sustainable wood. It has a really nice look, and the wood has been heat treated for extra durability. The lid is nice, and the extra large spaces between slats allow good aeration. But what if you want to build a wooden compost bin yourself? You still have a lot of options. I really like this booklet that has a bunch of different plans for compost bins that you can build yourself. There are a lot of ideas for different styles of bins, and the instructions are clear. You can also find plans online to build a wooden composter yourself, if you’re the handy type. The University of Missouri Extension has free plans for several types of compost bins, including a cedar wooden compost bin. Any other good sources for wooden composter plans out there that I might have missed? Photo found on Flickr.com courtesy of Collin J. 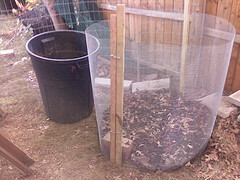 Three Bin Compost System Photo found on Flickr.com courtesy of Ashen Jaffer.There are a wide variety of books such as Basic Composting – All the Skills and Tools You Need to Get Started, and Easy Composters You Can Build that are excellent resources of information, and have entire chapters dedicated to the how-to’s of building compost bins, compost sifters, and other compost accessories. There are also some great resources on the web. For example, the University of Missouri has this online guide dedicated to building different styles of compost bins available for your use. 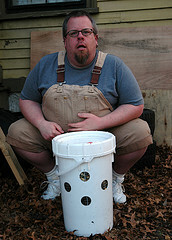 The University of Kentucky offers this great guide to building a compost bin. The University of Minnesota has this guide available in reference to different structures of compost bins. This is also an excellent resource. And finally, let’s not forget this comprehensive how-to guide available from the Environmental Defense Fund. The resources are out there, and we’ve managed to do some of the legwork for you! Now all that stands between you and building that perfect compost bin in your backyard is a quick trip to the hardware store to pick up a few supplies! Want to learn about composting in a more organized way? Read my book, How To Compost: Everything You Need To Know To Start Composting, And Nothing You Don't! , available on the Kindle or your computer at Amazon.com. Become a fan of Composting on Facebook to give and get even more information about composting success. Compost: What is it, anyway? Composting Info: Paper Towels - Are they Compostable? In a hurry? Here’s the ultimate one page guide to composting.